I’ve been obsessed with skincare ever since a light bulb went off for me a couple months ago. I’d heard people say time and time again that your skin is the foundation of how you feel, but I didn’t believe it. That is, until I started having allergic reactions to the products I was using out of nowhere! Hello 25 and the weird hormone changes that come with it. 🙂 All of sudden my skin was inflamed, covered in hives, and I wasn’t feeling very confident. I found myself in the skincare aisle and was instantly overwhelmed trying to decipher between all the cleansers, serums, oils, mists, spot treatments and every other confusing product on the shelf. Let’s not even talk about the sticker shock I got when I finally had the courage to pick up a product and take a closer look! I was not about to fork out hundreds of dollars for skincare products even if they were supposedly “life changing”. If you’ve ever felt this way, I’ve got you with this post! I am officially a skincare convert and so excited to share with you all of the steps I’ve incorporated into my daily routine to improve my skin. 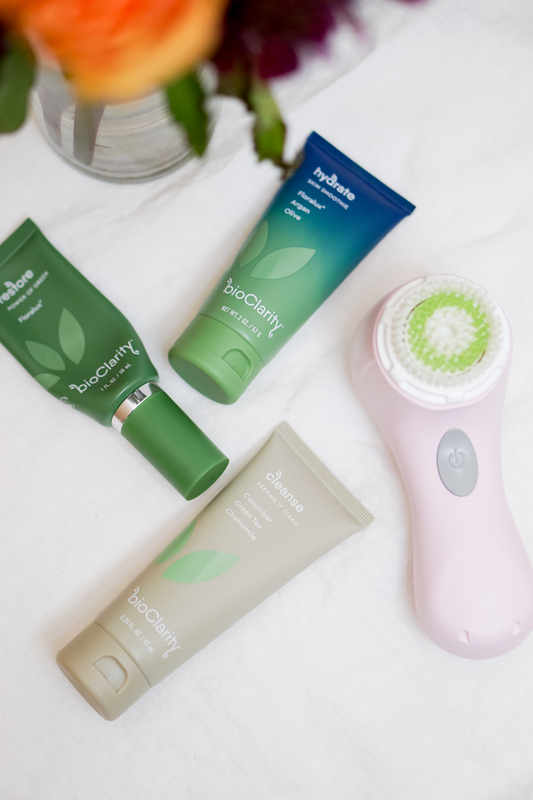 Each of the products I’ve been using contain natural ingredients that won’t irritate your skin and to make it even better, none of them are over $30! I can’t wait for you to feel more confident in your skin, rely less on your makeup, and start to embrace your natural beauty. Makeup Removal: I cannot stress enough the importance of taking your makeup off each and every time you wear it! 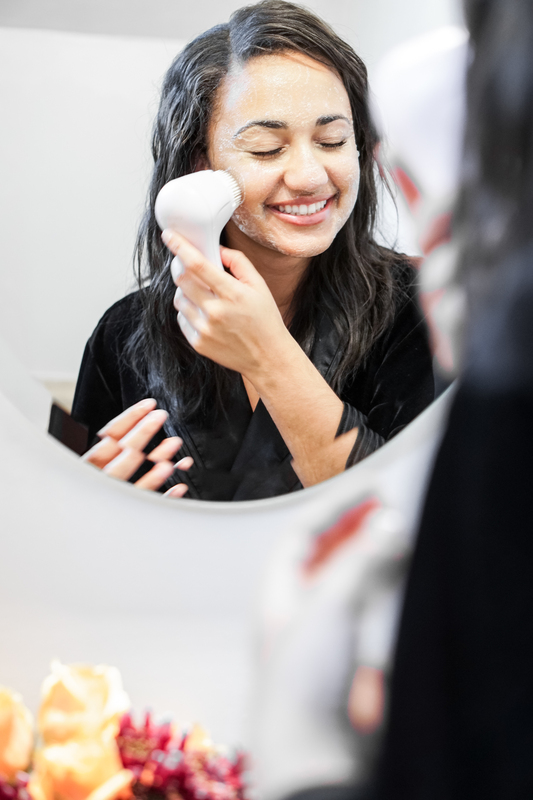 Hear this from a girl who used to NEVER take her makeup off before bed– you will never improve your skin if you aren’t willing to dedicate the time each and every day to this simple step. Every night before I go to sleep, I use Simple Beauty Micellar Water and a cotton round to remove all of the makeup from my face. I find that micellar water is more gentle, especially with removing mascara, and the bottle lasts so much longer than a package of makeup removing wipes. You can even grab a pack of these reusable cotton rounds from Amazon to make things even more cost efficient! Cleanser: After you’ve removed your makeup, it’s time to wash your face! Don’t fall for the idea that your face is clean after just the micellar water. There will always be some makeup and even residue from the micellar water left on your skin that you want get rid of with a good cleanse. 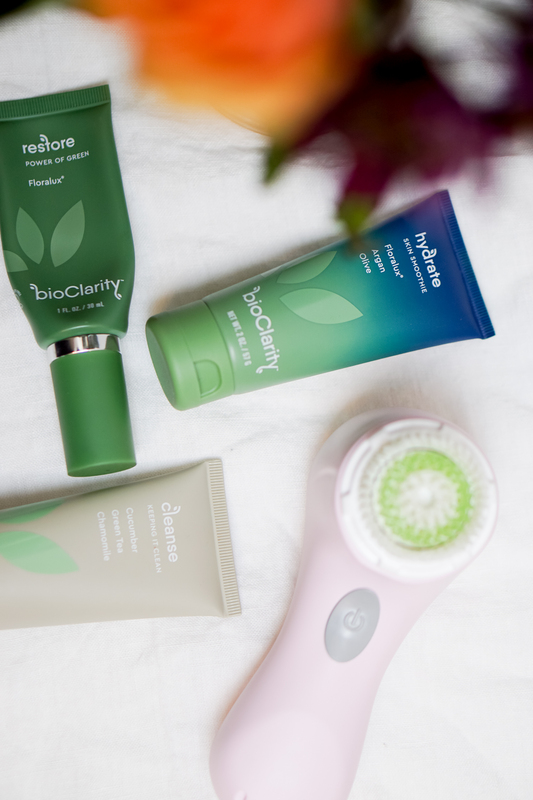 I’m loving the Bioclarity Essentials Routine right now! 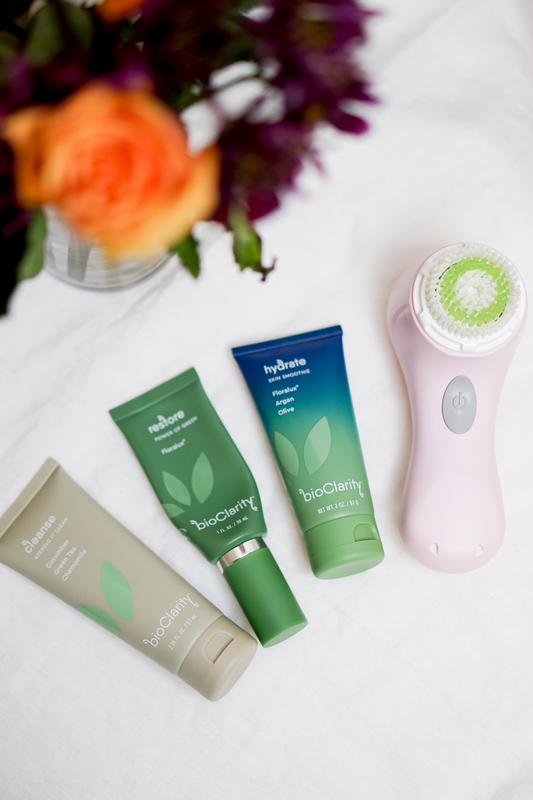 It’s a three part system with a cleanser and two types of moisturizers that are 100% vegan and plant based. 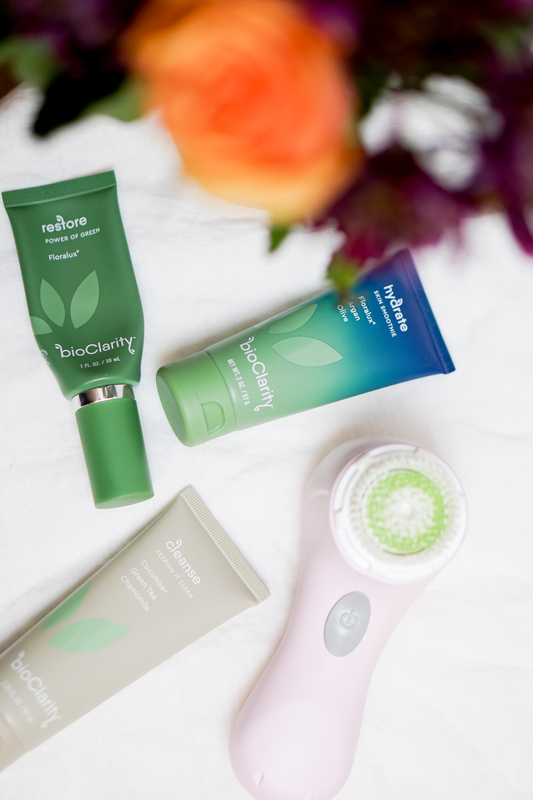 With either my hands or my Clarisonic, I apply a small dot of cleanser to remove the remaining dirt, oils, and makeup from my face. *If you are interested in trying out the Bio Clarity routines or even just a single product (which I highly recommend), use the code BIO15 at checkout for 15% off your total purchase. I promise, you won’t regret it! Toner: Next up is a good toner. To be honest I don’t use a toner regularly, but I have been looking to add the Pixi Beauty Glow Tonic into my routine. I’ll update this post once I’ve added it in and let you know what I think. If there is one you are loving, share with me in the comments below. I would love to check it out. Moisturizer: Since my skin is really dry, I focus most of my attention on keeping it hydrated with moisturizers and face mists. As I mentioned above, The Bioclarity Essentials Routine comes with two moisturizing products. First is their Restore gel which I’m absolutely in love with. This green gel is their signature product with floralux to feed and defend your skin cells. Put two pumps on your finger tips and massage into your face and neck after you have cleansed your face. Give it a couple minutes to soak in to your skin before applying the Hydrate moisturizer on top. Depending on the day, I interchange the Restore and Hydrate moisturizers and may only use one if my skin isn’t feeling super dry. Facial Oil: For extra moisture, you can add a facial oil in key areas of your face such as under your eyes, along your cheek bones, and on your forehead and chin. Be sure to apply any facial oils after you have put on moisturizer because the oil is able to penetrate through the moisturizer but moisturizer can’t penetrate through oils. I picked up the Honest Beauty Organic Facial oil a couple months ago and really like the added glow it gives. I either apply it at night to give it time to soak in or wear it on no makeup days to moisturize and give my face a nice glow. Face Mist: I absolutely love a good face mist! I have tried out the Tarte Ready, Set, Radiant Skin Mist, the Pixi Beauty Glow Mist, and the Honest Beauty Elevated Hydration Mist. Of the three, I like the Pixi and Honest Beauty mists the best. The Honest Beauty Mist is my current go to. I love it because it smells great and has hyaluronic acid to help attract moisture to your skin. There really is no limitation to a good skin mist, trust me! I use it on days I don’t wear makeup to keep my skin hydrated or spritz my face a couple times throughout the day to refresh my makeup. If you’re like me and love a good nap, spray your face a couple times with your mist after you wake up to brighten your complexion and refresh your makeup. Yes you read that right, I nap with my makeup on sometimes 😛 Don’t judge! Face Masks: Once or twice a week I love to exfoliate and use a facemask. At this point it has just become a little pamper session that I look forward to during the week and my skin feels great afterward. Here are some of my go to masks that I flip flop between depending on how my skin is feeling that day. Face Rollers: While I’m talking about skin care I figured I mine as well touch on the face roller trend. I picked up a Jade Roller for less than $10 on Amazon to see what all the craze was about. A great hack for using the jade roller is to leave it in your fridge and roll out puffiness in the morning after you shower. Just make sure you clean your roller after every use so you aren’t transferring bacteria to your face from previous uses. Your Pillowcase: I would also highly recommend washing your pillowcase frequently to make sure you aren’t transferring bacteria to your face. 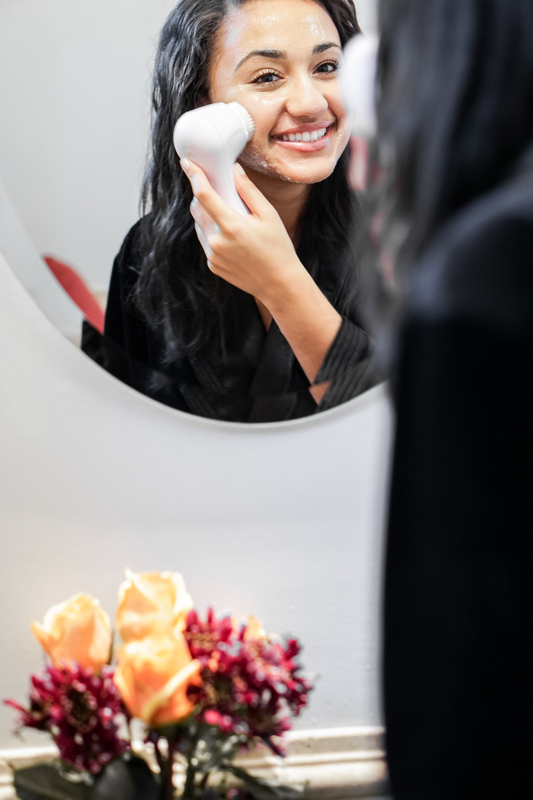 All of these new products you are applying before bed will get absorbed into your pillowcase and overtime transfer unwanted bacteria to your face. Set a reminder on your phone for as often as you can without losing your mind and remind yourself that it’s an important step towards great skin. Consider switching to a silk pillowcase as well. I haven’t yet, so I can’t speak to that but I know many people who recommend it. So that’s the scoop! All of the products I am loving and using right now to keep my skin hydrated, bright, and clean. If you decide to incorporate some of these steps into your skincare routine, send me a message and let me know! Over the last few months, I have seen big changes in the look of my skin and because of it I’ve been wearing so much less makeup. It’s so strange and exciting to love the way my skin looks. If that isn’t a win, I don’t know what is!